A few generations ago, when you wanted a really close shave or haircut you’d head to the barber shop, where you’d put your life in the barber’s hands. Lucky for you, today you can attain a close shave at home using electric razors, which remove the chance of cutting your skin open or worse. Shavers aren’t exactly a replacement for barbers but it’s the best next option if you don’t have the time or money to spend for barbers. An electric head shaver is a must-have for men who desire a bald head or any kind of hairstyle for that matter, not to mention that you can use the said shaver for facial hair trimming and styles as well. 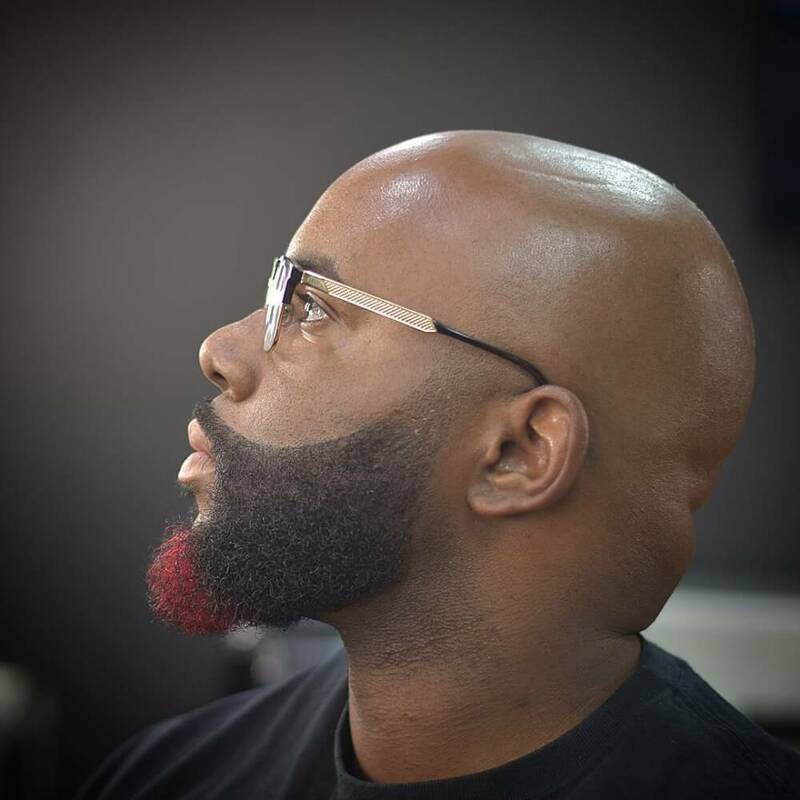 Finding the Best Shaver For Black Bald Head or beard can often times be a difficult task, especially for a black man’s hair. Afro-textured hair, because of its natural curly state and stronger hair fibers requires a different treatment than other hair types. 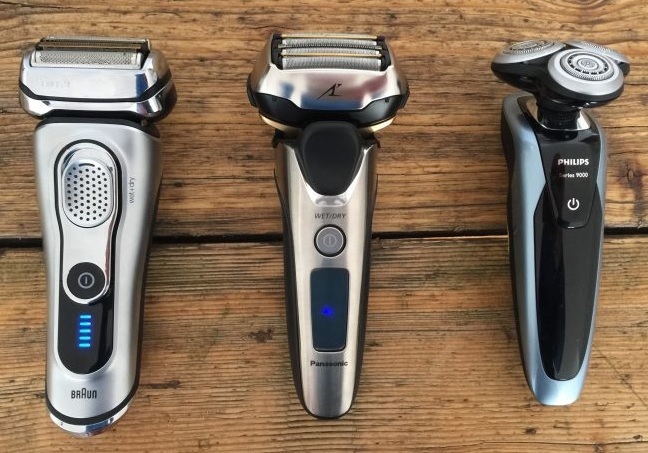 You will need a powerful machine to achieve the best hairstyle result and fulfill your vision or if you choose to rock that perfect clean shaven bald look – so we decided to make a recommended list of the best shavers for black bald head. Black men should use a shaver that can deal with their thick and curly hair and will help their skin stay looking fresh. Every person has different requirements, the hair on black men’s faces is generally quite dense, curly, and even coarse. Most Afro-Americans also experience ingrown hairs regularly. This means that a strong enough shaver is needed to really tackle the hair and produce clean, smooth skin. 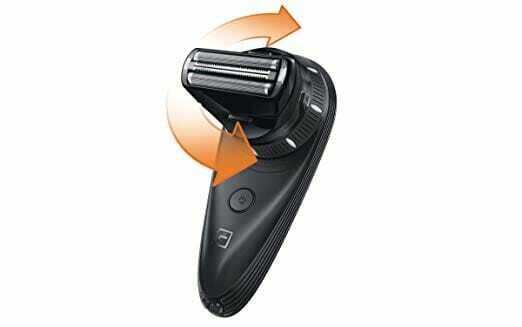 A bad shaver with a short lasting battery will lead to frustration and even damaged skin. Despite the popular misconception from barbers that you cannot see the growth’s direction of afro hair, it does grow in a definite direction so black men need very precise shavers and tools to groom their hair in the right way. When shaving afro-textured hair you don’t need to use more force, all good shavers are strong enough to cut through any hair type so you just haven’t found the best shaver for you yet. On a different note hair loss is something that affects over 40 million men in the U.S. and hundreds of millions more worldwide. A lot of people will try a lot of products to try to change or modify their hair loss, but the truth is there is nothing wrong with being bald and a lot of men look even more professional at work or attractive to the ladies sporting a clean-shaven head. If you’re getting over the denial phase and accepting that your hair truly is receding, the first thing you’re going to need to keep your hair in shape and style and it is the most important tool – the electric shaver. Foil razors have straight heads with thin, perforated metal foils that cover their blades. The slots in the foils trap the hair guiding it up to the blades, allowing the tiny scissor blades to cut closer to the skin. Rotary razors have three spinning blades covered by perforated metal discs. These little blades work like little grass cutters, moving in a circular pattern to chop hair. So which one is better? It depends. A foil razor is a good option if you’re committed to shaving daily; it offers a closer shave. Guys who have sensitive skin are better off with a foil razor. Rotary razors also don’t trim as closely, but they do offer flexible heads that can pivot and bend inward to follow the contours of the face, ensuring you won’t miss tiny patches of hair when using it. Rotaries are also better at trimming longer hair. With so many online sellers and places on the market today, we understand it might be a little confusing as to what product to buy. So we did our research based on popularity, online reviews, price, product quality, manufacturers, etc. We will be showing you the products specifications and most important features like battery life, battery charge time, extra functions, trimming options, even noise loudness. We will be including all these features in the list below as well as our own thoughts on what makes the product special or convenient in comparison to others to help you consider what razor is best for yourself. Note that the list is no particular order as all of the products we will show you are great buys. The Remington HC4250, our first machine on the list. The manufacturer says turn your haircut into a DIY project! This small and great self-haircut kit has everything you will ever need for a quality haircut at home. The ergonomic design fits comfortably in your hand and the curved blade works with the natural shape of your head so self-haircuts are made easy, comfortable and precise. Plus, it’s 57% wider than standard haircut clippers, making the job so much faster. The lithium powered battery provides a 40 minutes runtime, and the corded/cordless feature ensures you have enough power to finish what you started so this shaver will never let you down. A little bonus is the shaver is easily washable under a faucet for quick cleaning. All in all, this is a great product offering you everything you need: faster shaving time, great battery time, super good quality razors inside, it’s easy to handle and offers a wide variety of lengths all for a good price. We would definitely recommend this shaver! Travel Pouch, Cleaning brush and dock. 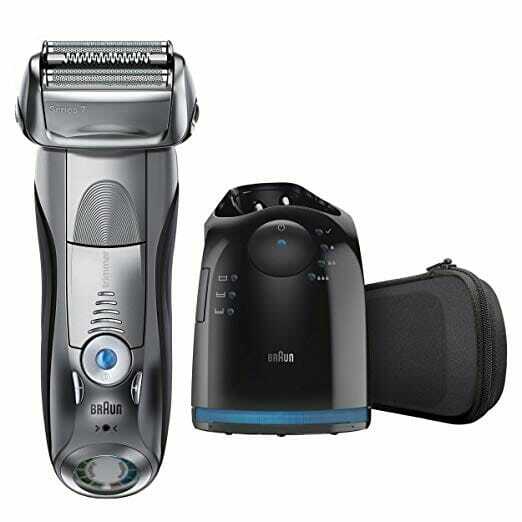 The next shaver we recommend is the Braun Series 7. It is the bestselling electric shaver in the world. The Braun Series 7 790cc-4 makes for a clean, close and comfortable shave that lives up to the most expensive shavers standards. It’s a very innovative product including features not found in most razors. 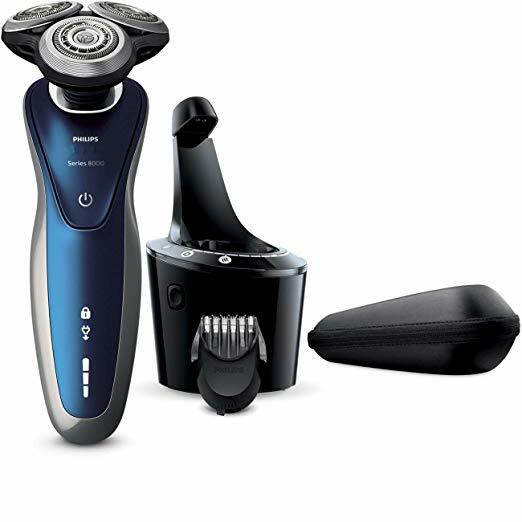 At the forefront of these features is the OptiFoil feature that Braun claims to cut facial hair as short as 0.05mm. Build quality is also another strong suit, includes a great battery lasting up to 50 minutes. A feature we found a very interesting is the foil design and the flexible head which will result in a close shave in as little as two passes without irritating your skin as well as the 3 shaving modes – the extra sensitive, normal and intensive mode which would be perfect for applying to your personal hair, especially for afro hair. The docking station makes the cleaning process very easy and straight forward. Some cons include dry shaving only meaning you can’t use it to wet shave also it’s a little pricy but despite this, we think it’s a great product to have. Being a bestselling product doesn’t lie, we certainly recommend it. Third on the list we have the Philips Norelco QC5580, another less pricey alternative. It comes with less accessories than our last pick, you only have the basics: hair combs, the clipper with a rotating head (rounded and skin friendly), cleaning brushes, storage case and of course the power chord. The Norelco trimmer blades are self-sharpening and made with stainless steel that ensures high-quality for cutting hair for a long time. Moreover, you can clean the blades under water easily. Again this is a great product for a great price, suitable for men that travel a lot and have no time for barbers, it’s easy to use by yourself, feels comfortable and comes with a great technology and razors that don’t irritate the skin. On top of that it has a great usage – span, as cons we would say it’s a bit noisy but nothing you can’t handle. A great buy for any black man looking for an easy to use, not too pricey and clean cutting shaver. Patented Super Lift and Cut dual-blade action lifts hair to cut comfortably below skin level. Flexing and floating heads automatically adjust to the curves of the face for less irritation. Fully washable design for easy cleaning. Lithium-ion battery 50 min. shave time/1 hour charge time. Another amazing shaver from the Phillips Norelco line at a great price. 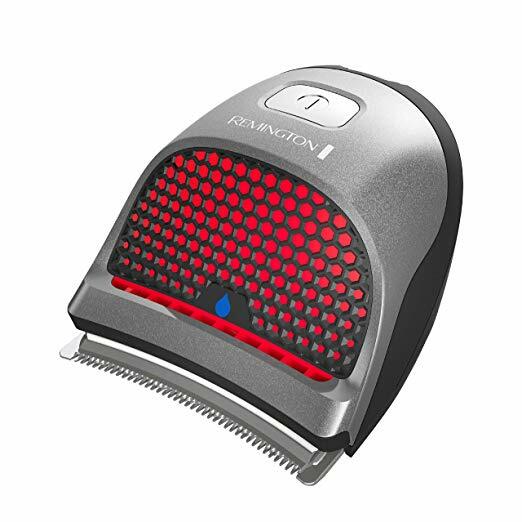 The shaver has a curved shape so it’s great for handling, it is also a rotary head style with three rotaries. No matter if you’re shaving wet or dry you’ll be getting a powerful wet or dry shave, but your skin will still be well-protected. The shaver comes with a great Skin Protection System. This means that there will be less shaving irritation thanks to the Aquatec seal. If you choose to only wet dry the shaver works perfectly and smoothly anyway, without causing irritation. You can easily clean it underwater and it comes with a brush so you can get out the tiny hairs. The rotating heads are low-friction so that the shaver will never get hot or burn your skin. It’ll remain cool, to give you a nice good shave. The head will move in four different directions. The rotating blades are installed on the so called Flex and Float system. This makes it much simpler to give yourself a shave, as the blades will easily follow the contours of your head. The shaver has also been designed with a patented Super Lift and Cut dual-blade action system. The blades pull up the hair first, snipping it off after. Trimming happens just below skin level, without hurting and still feels comfortable. If you’re looking for something cheaper that comes without many accessories like cleaning stations, this razor is a great fit for you. The click on beard styler feature, offering five length settings, gives you the freedom to create any look you want. Charges fully in one hour. Previously we talked about affordable Phillips Norelco shavers, this one is a little more on the pricier side. This electric shaver is designed to contour to the curves of your head and cut precisely close to the skin, regardless if you’re wet or dry shaving. Cutting 20% more hair in a single pass and 30% closer to the skin making for a super advanced shave. The whole shaving unit that houses the three heads can pivot, while the head holders can tilt inwards. This product comes with an automatic cleaning station which uses a detergent-based cleaning fluid and it automatically charges, cleans, dries and lubricates the shaver. It also comes with a nice travel case. It comes with a great battery that charges in an hour, including a 5 minute quick charge feature which comes in handy when you just don’t have the time. A downside would be it can only be operated cordless. Note that the cleaning station also charges the shaver. If you’re a fan of rotary shavers this would be a great pick for you, works perfectly for afro hair as it works in a way where it pulls in hairs then cuts them, perfect for a clean cut. Cons would include a little harshness when using it, so you should skip this one if your skin is very sensitive. We wrap up the list with this model, which we found is a considerable choice. Every person has different requirements, and black men usually have specific needs when it comes to shaving. This means that a strong enough shaver is needed to really tackle the hair and produce clean, smooth skin. Cheap shavers with short battery life will lead to frustration and even damaged skin. Ingrown hairs do not have to be a byproduct of shaving. Electric shavers don’t cut directly on the skin, as ordinary razor blades do, cutting and reducing the number of ingrown hairs. There are many features to consider when buying shavers for black bald head, so we hope we gave you an idea for what to look for when shopping for shavers, or maybe you would consider one of the products we had on our list.